A memorial sign dedicated to Sandy Hook shooting victim was stolen from a Connecticut playground by a man who later called the victim's mother to tell her the massacre never happened. 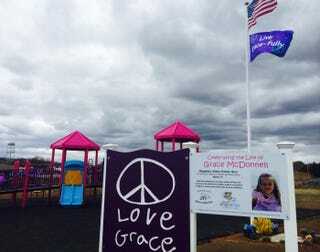 William Lavin, who's "Where Angels Play Foundation," has been building playgrounds to honor all 26 victims, told The Day of New London McDonnell's mother Lynn found out about the theft when the man who apparently took the sign called her. The thief reportedly told McDonnell he stole the sign because he believes the shooting at the school was a hoax. McDonnell was upset, and worried about how the theft might affect those who helped build the playground, Lavin said. The foundation has ordered a replacement sign. I'm not really sure what goes on in someone's mind when they do things like this. How a person can get so wrapped up in things they read about online that they completely lose all sense of decency. To do this to a grieving mother—I just don't understand it. [A] message found spray-painted Sunday at the Ana Marquez Greene Memorial playground in Hartford read, "Peace to Sandy Hook," using a peace sign and the numeral "2." It was later removed. Ana's mother, Nelba Marquez Greene, told WTNH-TV she was not upset with the graffiti and plans to raise money to put up a graffiti board to allow others to leave similar condolence messages. Image via Where Angels Play.